Update: Both have gone to their new homes. Please email if you'd like to be put on the waiting list for our next litter. These two boys are well-started on training, inside & outside, crate trained & 99% housebroken. They're also lightly started on stock (goats & poultry) & both showing lots of ability & promise. They would both make excellent companions &/or farmhands &/or performance prospects! The price of $500 is negotiable to the right home. Sable male with white on paws & chest – this correct & stocky-built guy is very smart & sweet, & independent-minded. He shows good working drive & will need a home who’s experienced in the herders, with the human who’s training him being an experienced one, who’s also as strong-willed as he is, who will be able to properly train him as he will likely be a bit of a challenge. This guy will be one who will test you, your abilities & certainly your patience, & will require a *very* consistent & FIRM (NOT to be confused with “severe”, as Corgis in general do not respond well to severe forms of correction) approach to training/correcting, b/c he’s also a little smarty! This guy will ONLY be available to an experienced farm/competition home who will be able to provide him w/ the proper training & environment necessary to his (& his humans’) overall well-being. 2/11 UPDATE: Felix has indeed settled down considerably, with some more maturity on him. He's doing well on training, inside & outside, is a willing & biddable boy who likes to please, buttttttttt . . . he hasn't yet gotten over his philosophy that his ideas are better than the human's, LOL. He does great w/ the goats & poultry, showing very good drive, heading & heeling. Black-headed Tri-colored male – this snazzy guy is a little on the shy side (but not timid/submissive) & is verrrrry sweet & smart! He shows good working drive but gets disconcerted by too much noise/ruckus/etc., so will sit back & observe, waiting for things to settle down enough for him to join right back in! 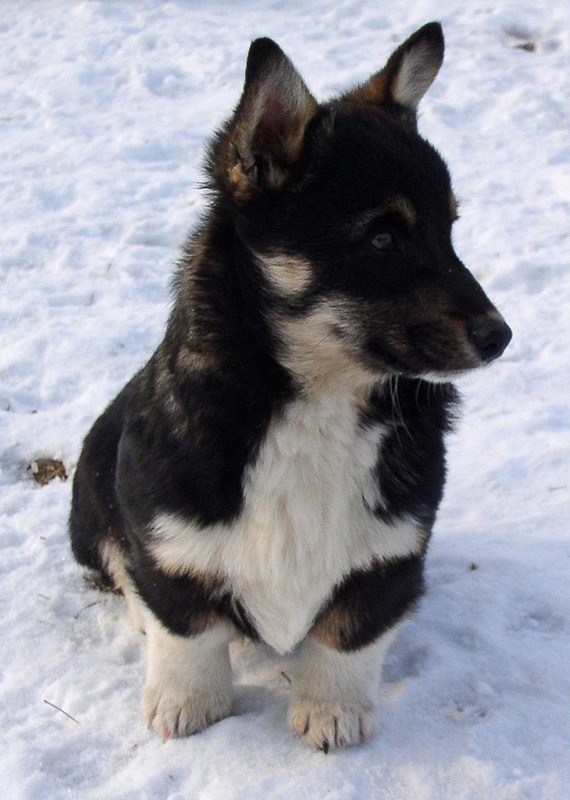 He would make a fine, little farmhand & would be a good candidate for someone who’s just getting started in the herders who’d need a little calmer, quieter type puppy. He’ll be easy to train & the human who’s training him will need to also be calm, quiet & patient . . . but more importantly, will NOT use ANY severe forms of correction with him, as that would be detrimental to his very sensitive outlook on the world. 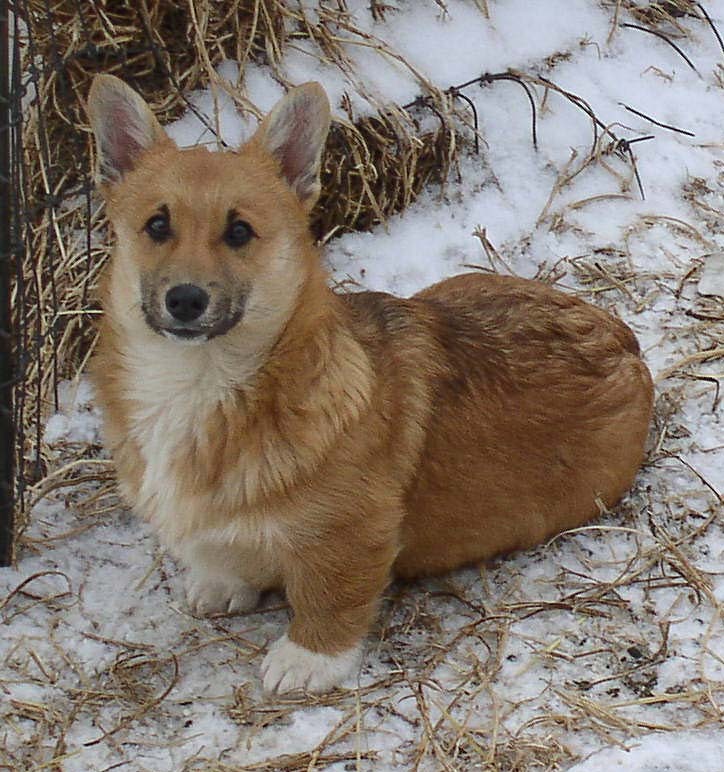 We usually turn away people who live “in town” who contact us, looking for a Corgi puppy as one of our primary focuses is on preserving the traditional farm/stockdog-type Corgi, but we feel that this guy would be okay w/ being a town dog, as long as he got the proper stimulation & exercise required to keep any dog happy & healthy. 2/11 UPDATE: Felix has also really blossomed with some more maturity on him. He's developed lots more confidence since his baby description above & is a really versatile young fella who's just as happy inside, lounging on a warm, comfy pillow as he is outside, in below-zero weather herding goats & chickens around!